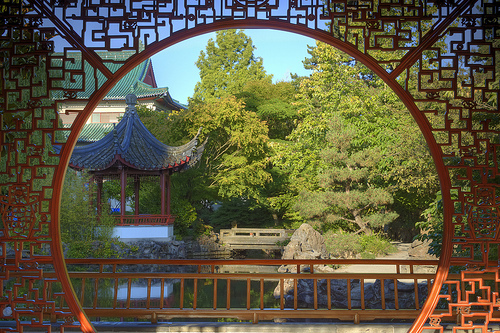 Chinese Gardens are an important part of Chinese cultural diplomacy. In a recent post to where words fail, Australia-Vietnam Relations; Building trade, social capital and security through culture in Asia, I argued that Australian governments should strengthen assistance to the artistic, cultural and creative export industries and that Australia’s trade strategy should be ‘culture led’. I said that cultural goods, unlike other exports, help purchasers develop an experiential level of understanding of the exporting country. Such understanding breeds familiarity and comfort that will benefit the exporting nation in the years to come, not only with increased export revenues, but by building national security and contributing to global stability. In that post I quoted the renowned cultural theorist Dr. Paul Schafer, who, in his forthcoming book The Secrets of Culture, argues that whilst culture has been viewed largely as an extension of the economy, it will prove more profitable in the future to treat a country’s economy as an extension of its culture. In the Chinese government’s most recent five-year plan, there is a chapter dedicated to exporting Chinese culture. The plan calls for a building of the China brand through international dialogue, cultural exchange, and cultural aid. Libraries, media centres and information services are to be established internationally. The trade of cultural goods is to be promoted. From 2003 to 2010, state investment in the arts grew at an average annual rate of 33 percent to an aggregate amount of $14 billion. Eighty thousand students graduated from Chinese art schools in 2010, a 15-fold increase in the course of a decade. In all, hundreds of thousands of young people are currently enrolled in the nation’s university level studio, art history, and arts-administration programs. The Art Asia Pacific Almanac 2010 reports contemporary art is now exhibited in 37 Chinese museums, 23 nonprofit art spaces, and 197 galleries, an explosion from 10 years ago. China has become one of the world’s largest art markets, accounting for 23 percent of global art sales by value. In 2011 $540 million worth of Chinese art, mainly contemporary, was sold at auction, a level surpassing America’s comparable $310 million. But developing China’s influence abroad through culture is not limited to exporting cultural goods. Investment in the well-known Confucius Institutes, which teach Chinese language and culture to foreigners, will continue to grow; there are now over 858 Confucius Institute facilities worldwide, including 81 institutes and 299 classrooms in the United States. poured funds into movie studios, theme parks and other ventures of the Wanda “cultural enterprise” arm since Chinese President Xi Jinping stressed that entrepreneurs should “enhance Chinese culture as the country’s soft power tool”, in keeping with the “great rejuvenation of the Chinese dream”. it is his entertainment ambitions that have garnered the greatest attention. He is building a $9 billion “Chinese Hollywood” in the north-eastern port city of Qingdao, complete with 20 movie studios, indoor theme park and yacht club. He flew in dozens of A-list international celebrities for the groundbreaking ceremony last year, including Nicole Kidman, Leonardo DiCaprio, John Travolta and Tony Leung Chiu-wai. In 2012, Mr Wang bought AMC Entertainment Holdings, the second-largest US cinema chain. With a stated ambition of controlling 20 per cent of the global film market by 2020, he has entered talks to buy large stakes in Hollywood studios Metro-Goldwyn-Mayer and Lions Gate Entertainment, which owns The Hunger Games and Twilight franchises. At the end of Wen’s article, Mr Wang provides an interesting statement with regards to his thoughts about culture and Government involvement. When nations and states are looking for avenues of economic growth, it is important to look at countries that have achieved high levels of growth to see which aspects of their success can be emulated. My home country of Australia, which is achieving very modest growth figures and needs to diversify its export base, would benefit from prioritising industry assistance to cultural export industries in a similar manner to China, which Miller says ‘parallels its existing support of overseas investment’. When the Chinese government started prioritising development in its cultural industries, entrepreneurs like Mr Wang also developed an interest in it. Industry assistance reduces costs, (particularly opportunity costs for exporters) and makes it a more attractive area for investment. To emulate the Chinese approach, the Australian government would need to create an environment so enticing that investors would feel like they were about to ‘miss the boat’ if they didn’t buy into the cultural and creative industries. The Australian Government would also need to develop a respectable cultural diplomacy body, or strengthen the neglected and under-utilised Australia International Cultural Council to advance Australia’s national interests abroad through relationship building and culture. It would be great to see an exciting entrepreneur emerge that sells Australian culture to the world in the way that Mr Wang sells Chinese culture, but the environment needs to be created whereby such an entrepreneur can emerge and thrive. As I’ve argued elsewhere, exporting cultural goods and having a strong cultural diplomacy presence is imperative not just in economic terms, but in advancing Australia’s national security and contributing to regional stability, which is why it needs Federal Government involvement and can’t solely rely on market environments. If China’s approach to internationalising its culture, via both cultural exports and cultural diplomacy, provides a “giant advertising agency for socialism,” surely a similar approach would work to create ‘a giant advertising agency for Australia’ and the ideas it wants to contribute to the world. There is much more to say in wherewordsfailblog.com about the relationships between culture and commerce, and in a post currently in development I’m examining many of the spin-off and ‘multiplier’ benefits that putting culture at the centre of international trade development can bring to an economy, such as image building, attracting Foreign Direct Investment, contributing to a vibrant society and strengthening social cohesion – so stay tuned for more! Click here to check out previous posts about China from wherewordsfailblog.com. Photo credit listed on the next page.